Smartphone CPU Checker is a small application for windows computer created by RootKHP Team, which allows you to gain the root access on your Android Smartphone and tablets in a single click only. The overall interface of the RootKHP Tool is quite simple, and it comes with 3 buttons, i.e Update program, Donate for develop and Root Button. The update program button allows you tot quickly update the RootKHP Tool with the latest version, donate button allows you to donate to the developer of the root Tool. 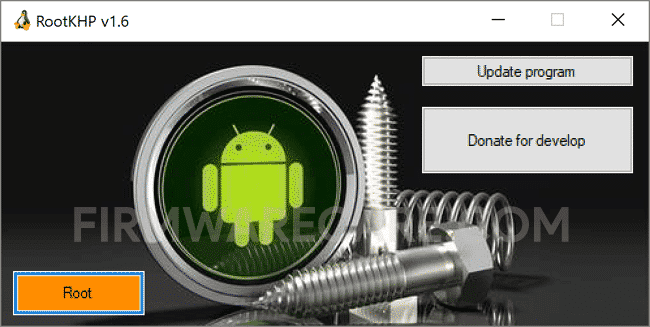 And the Final Root button allows you to Root the Android Smartphone and tablets using the Fastboot and ADB methods. It supports majority of Samsung Devices, HTC Devices, Lenovo Devices, LG devices, Motorola devices, Huawei Devices, Micromax Devices. In order to use the RootKHP Tool, you need to install the Universal ADB Driver on your computer. [*] Compatibility: The RootKHP Tool runs perfectly on Windows XP, Windows Vista, Windows 7, Windows 8, Windows 8.1 and Windows 10 (32 bit and 64 bit). [*] Credits: RootKHP Android 7.0 Root is created and distributed by RootKHP Team (developer). So, full credits goes to RootKHP Team (developer) for sharing the tool for free.